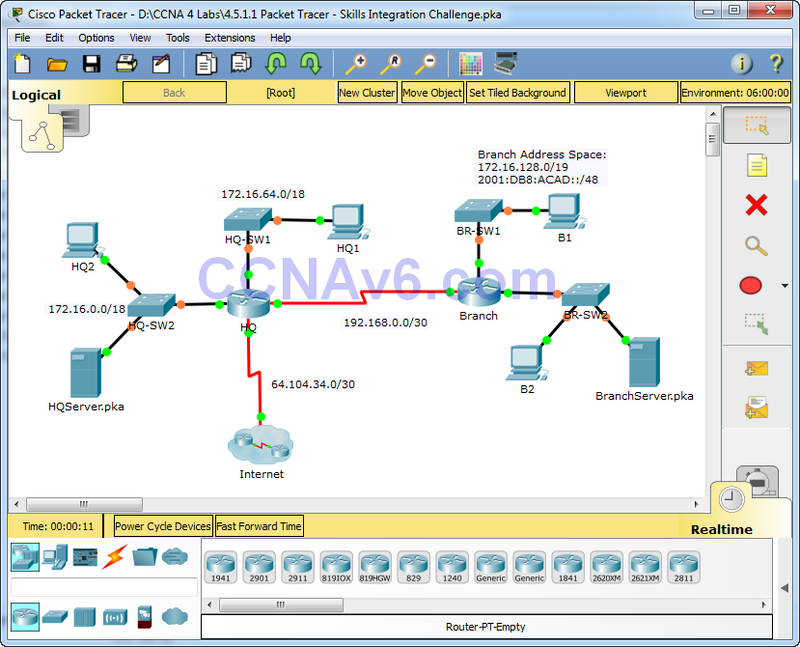 In this challenge activity, you will finish the addressing scheme, configure routing, and implement named access control lists. a. Divide 172.16.128.0/19 into two equal subnets for use on Branch. 1) Assign the last usable IPv4 address of the second subnet to the Gigabit Ethernet 0/0 interface. 2) Assign the last usable IPv4 address of the first subnet to the Gigabit Ethernet 0/1 interface. 3) Document the IPv4 addressing in the Addressing Table. 4) Configure Branch with appropriate IPv4 addressing. b. Configure B1 with appropriate IPv4 address using the first available address of the network to which it is attached. 1) Assign 2001:DB8:ACAD:B1::1/64 and 2001:DB8:ACAD:B2::1/64 to Branch’s Gigabit Ethernet 0/0 and Gigabit Ethernet 0/1, respectively. c. Configure Branch with appropriate IPv6 addressing. d. Configure B1 and B2 with appropriate IPv6 addresses using the first available address of the network to which it is attached. e. Document the addressing in the Addressing Table. · Assign the process ID 1. · Advertise all attached IPv4 networks. Do not advertise the link to the Internet. · Configure appropriate interfaces as passive. g. Set a IPv4 default route on HQ which directs traffic to S0/0/1 interface. Redistribute the route to Branch. h. Design an IPv4 named access list HQServer to prevent any computers attached to the Gigabit Ethernet 0/0 interface of the Branch router from accessing HQServer.pka. All other traffic is permitted. Configure the access list on the appropriate router, apply it to the appropriate interface and in the appropriate direction. i. Design an IPv4 named access list BranchServer to prevent any computers attached to the Gigabit Ethernet 0/0 interface of the HQ router from accessing the HTTP and HTTPS service of the Branch server. All other traffic is permitted. Configure the access list on the appropriate router, apply it to the appropriate interface and in the appropriate direction. j. 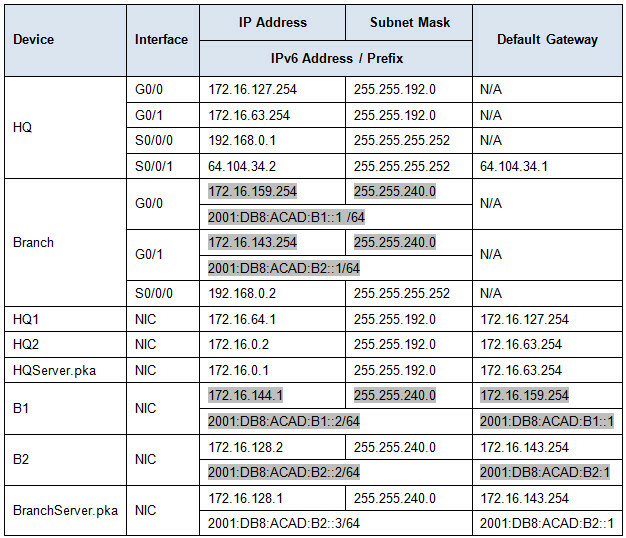 Design an IPv6 access-list named NO-B1 to prevent any IPv6 traffic originating on B1 to reach the BranchServer.pka. No traffic should be permitted from B1 to BranchServer.pka. Apply the IPv6 access to the most appropriated location (interface and direction).